Oh yeah. I am aware that it's yet far from summer but there's nothing wrong about getting ahead of the game, 'ayt? I have three pairs of sunglasses... before. Somehow, my carelessness has resulted to misplacing two of them. Until now, I am unsure where they are. I have no clue, whatsoever. I am just happy that I've been able to keep the pair that my boyfriend has purchased for me online or else, I'll be left with none! My eyes will then have a horrible 2011 summer! No way! Because I am such a careless creature, it maybe is time for me to look for wholesale fashion sunglasses... something like 29USD for a dozen or cheaper. 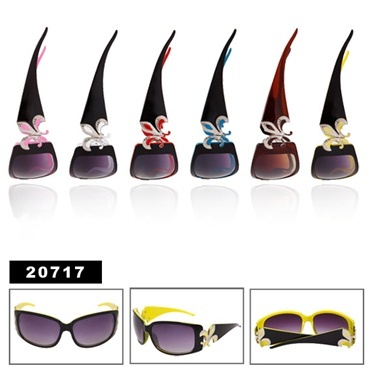 I do not care if they all have the same design but definitely, in assorted colors... just like these Fleur de Lis sunglasses which are known for its catchy symbol. I have my eyes on this particular Fleur de Lis design [refer on the photo below] that will cost me 26USD a dozen. For about $2.20 per pair, that's a good deal, isn't it? If you are like me who feels like summer's not summer at all without putting on those sunglasses [and is... well... heedless], it's wiser to buy wholesale sunglasses! Lose 'em, misplace 'em and yet, still have some pair on the side. Smart, huh?